This group has appeared at the Boston and Berkeley Early Music Festivals and was invited to perform at the Seventh International Festival “Misiones de Chiquitos” in Bolivia (April – May 2008). In addition to the Bolivian performances, they also performed in Cusco, Peru, bringing some of the Peruvian Baroque music back to its compositional chapels. 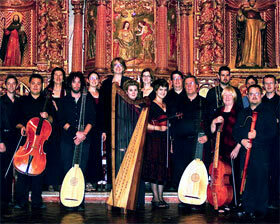 The North Texas Baroque Ensemble was the primary group in the “Armonia Stravagante” recording.